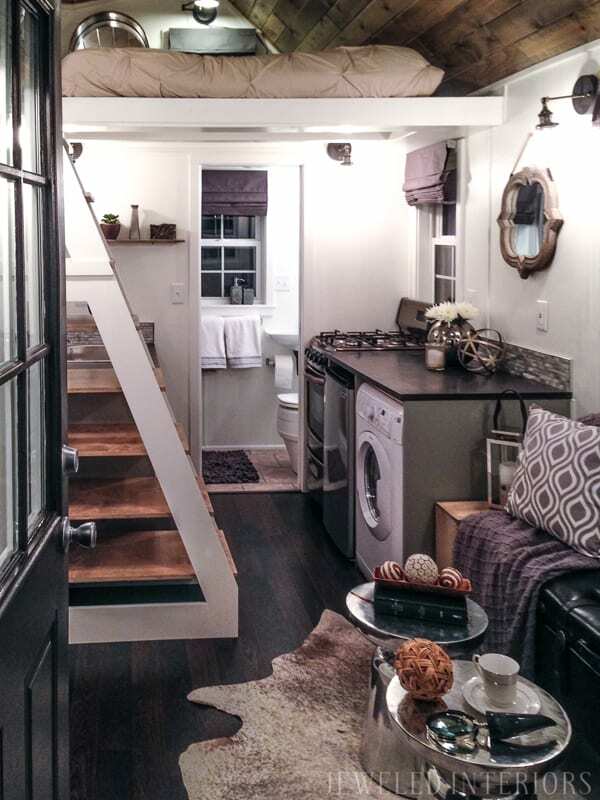 A Rusticly Chic TINY HOUSE- You have got to see this beauty! 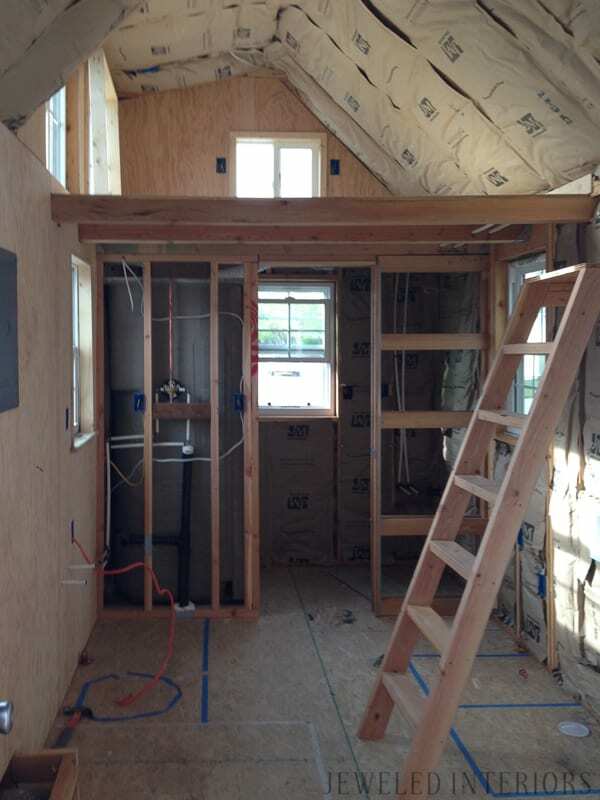 Recently I was involved in a small project…By small I mean TINY- Literally, a TINY HOUSE! 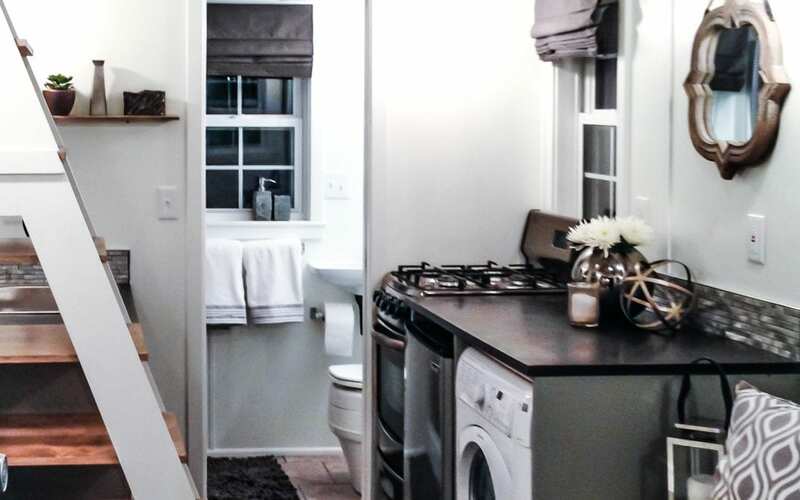 The design vision for this petite little abode? 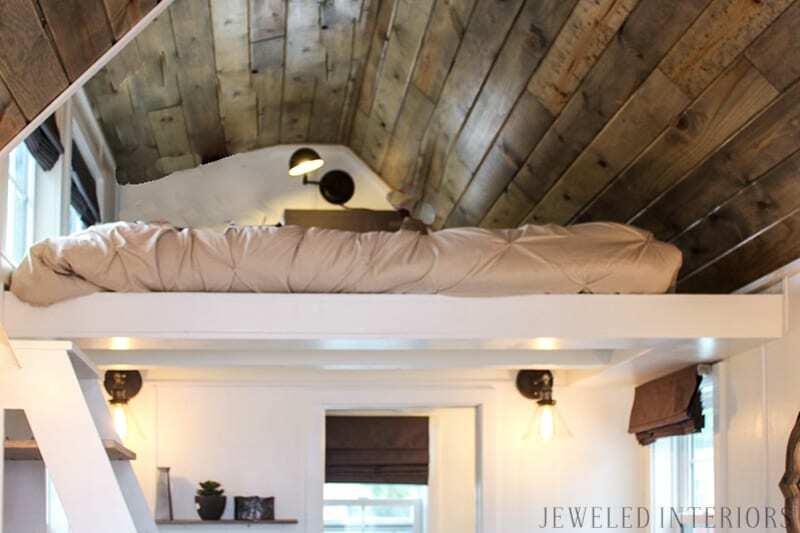 Rustic Chic. 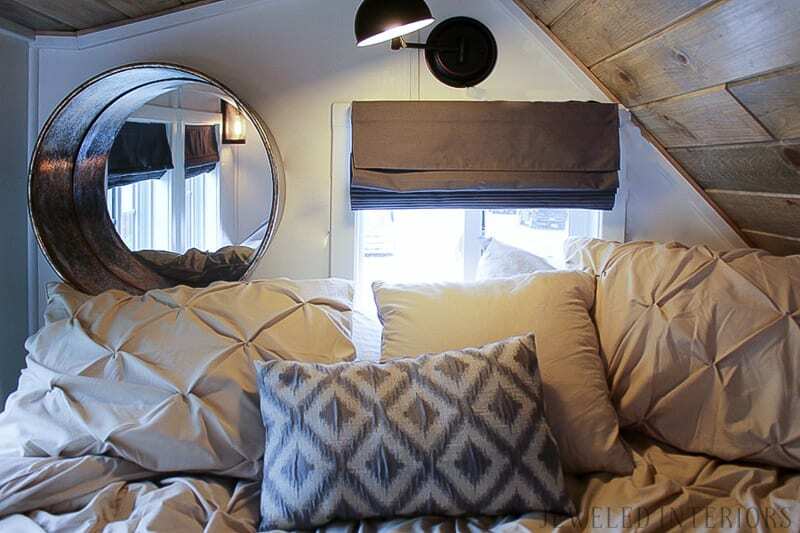 I wanted it to be earthy enough to feel comfortable in the hills of Sun Valley, but sleek and polished enough to feel like HOME. I was brought in on this project by Mr. Dave Holland, a teacher of a Gifted and Talented Program at a local school. The idea behind this endeavor was to help students learn about the world around them while simultaneously building with their hands. This idea was hatched as a way to help them use higher level thinking and problem solving. While Mr. Holland and the students did all of the hands on work, my role was to pick out finishes and to stage the little nest to look fabulous for potential buyers. 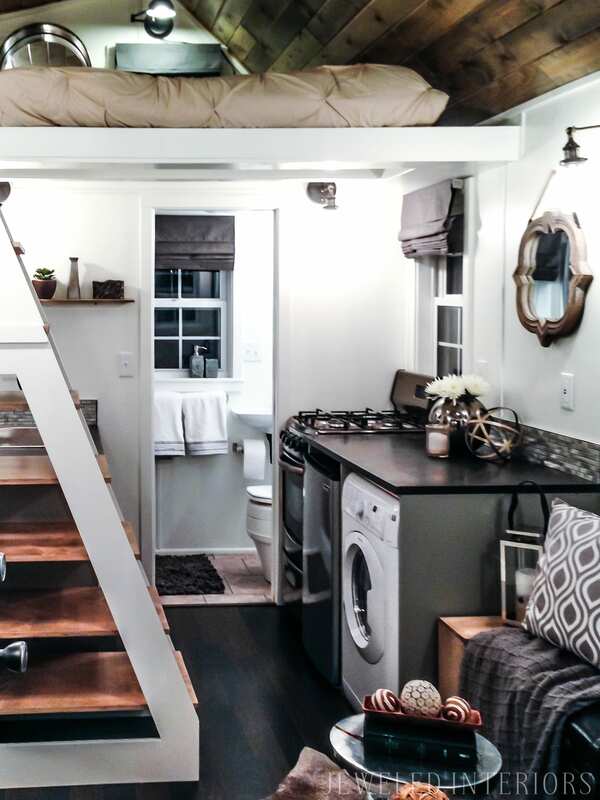 While normally decorating less than 200 square feet would be relatively simple, it was a little more exciting in tiny house terms. 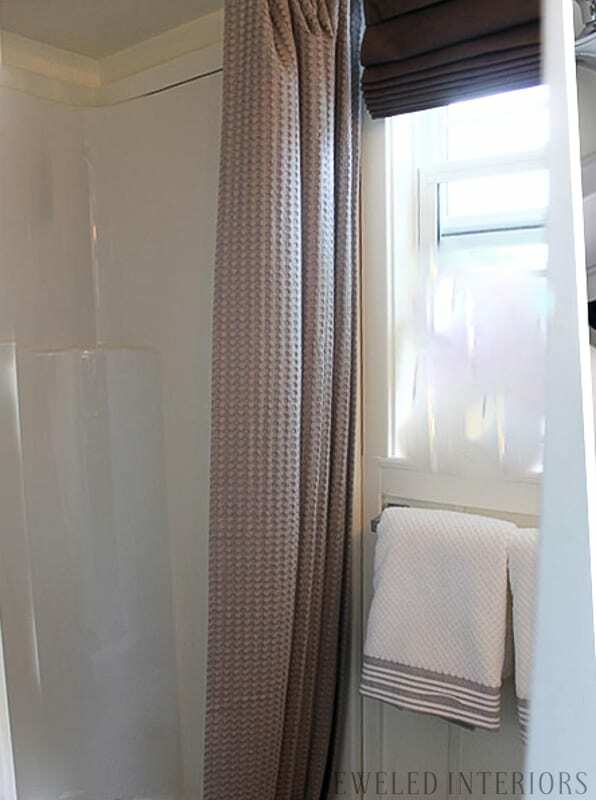 Yes, it is small square footage, but I was still designing a living room, kitchen, bathroom, and bedroom. FUN!!! Not only was I picking out finishes and fixtures, I worked with Mr Holland (with his students’ inputs of course) to brainstorm the best use of space. 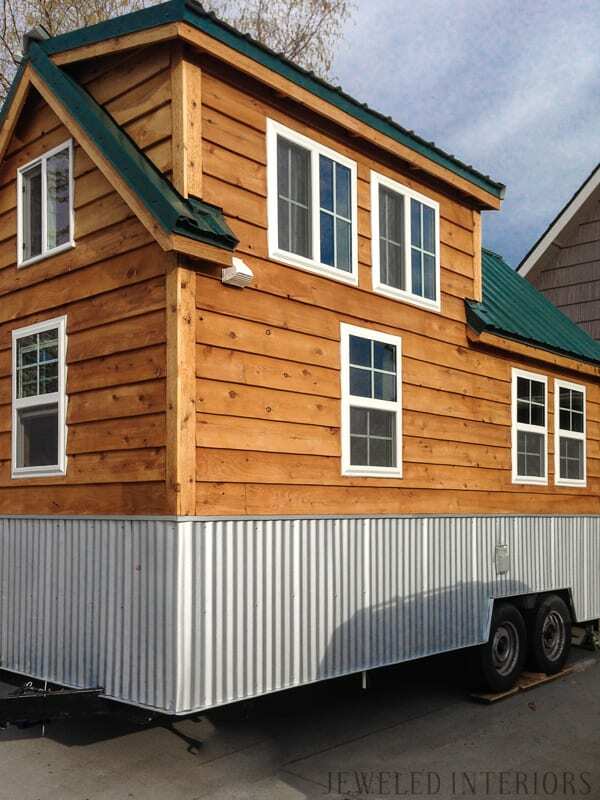 We had to be smart with the square footage we had. This little gal had to have beauty and brains! The design asthetic I was aiming for was a rustic-chic. Sophisticated neutrals were a natural fit. 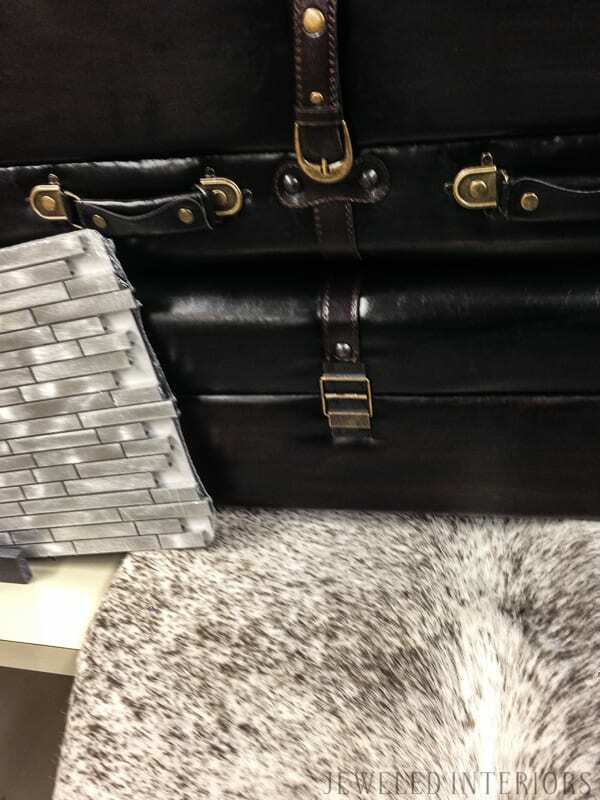 We picked grays with warm undertones for cabinets, window treatments, etc. 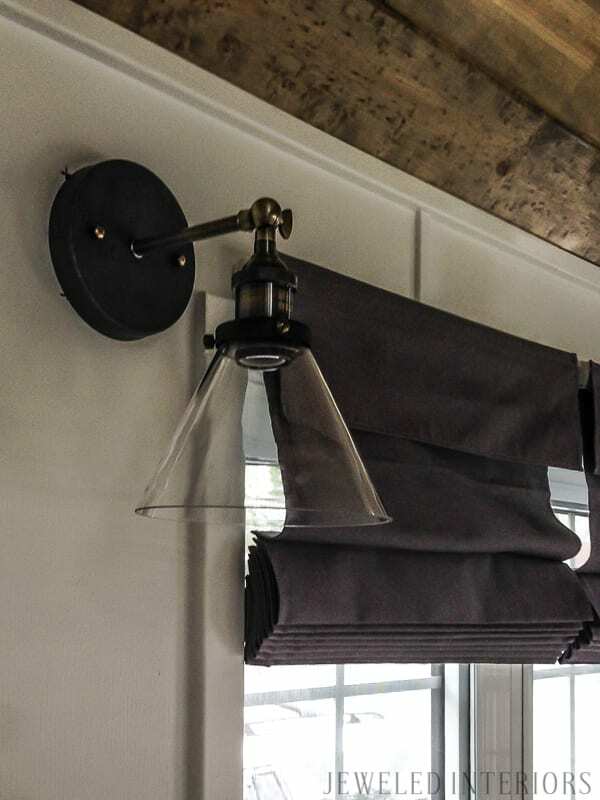 Silvers and antiqued bronze metals added a touch of style to this functional eye-catcher. The exterior was already well underway before I entered the scene. Mr Holland picked out rugged, lightweight materials. 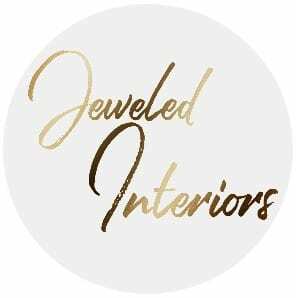 As for the interior, we needed to make this shine. 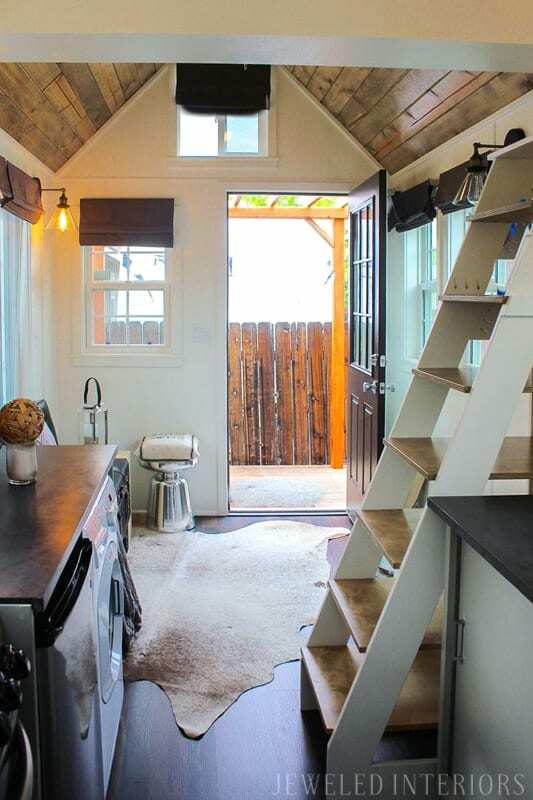 Many tiny homes are bare-bones and sometimes primitave and dark. We wanted this one to be bright and airy. We chose white walls and stunning oak ceilings finished in a weathered oak stain. For seating I opted to take two long benches and Mr Holland built them into a sofa. 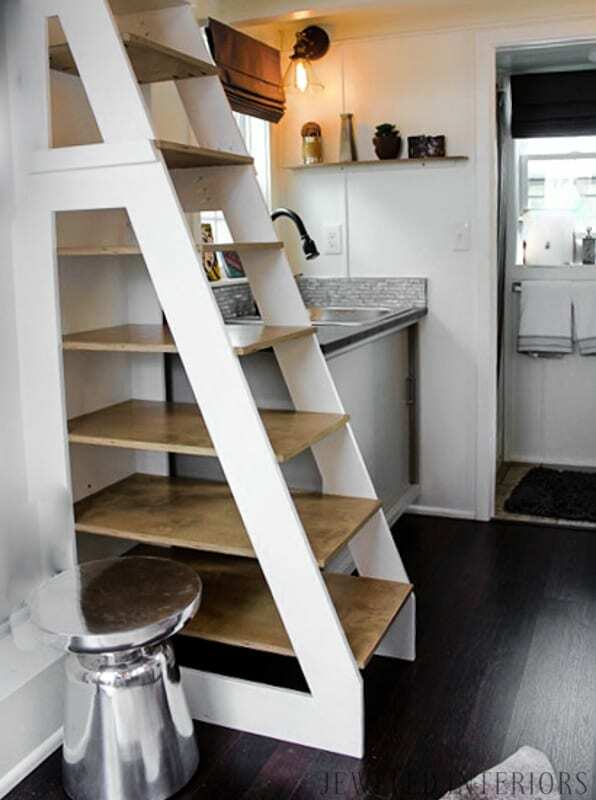 This space saving option also provided extra storage…KAPOW! 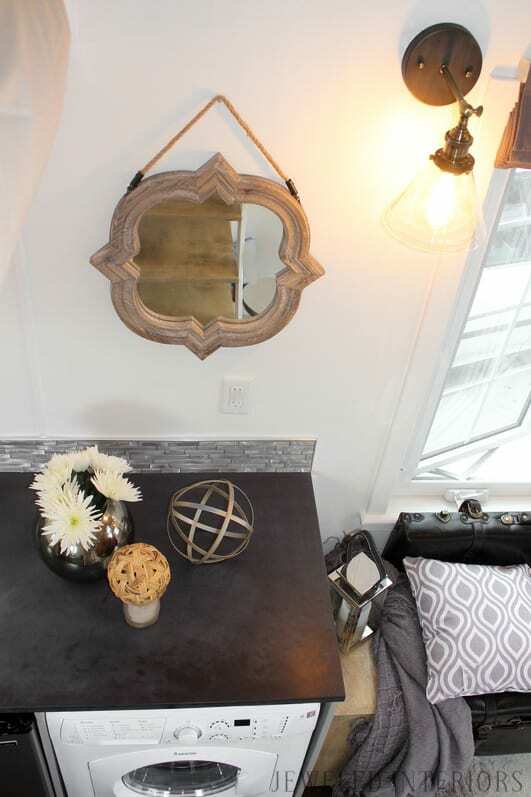 One idea was to build a fold-down desk on the opposite wall. 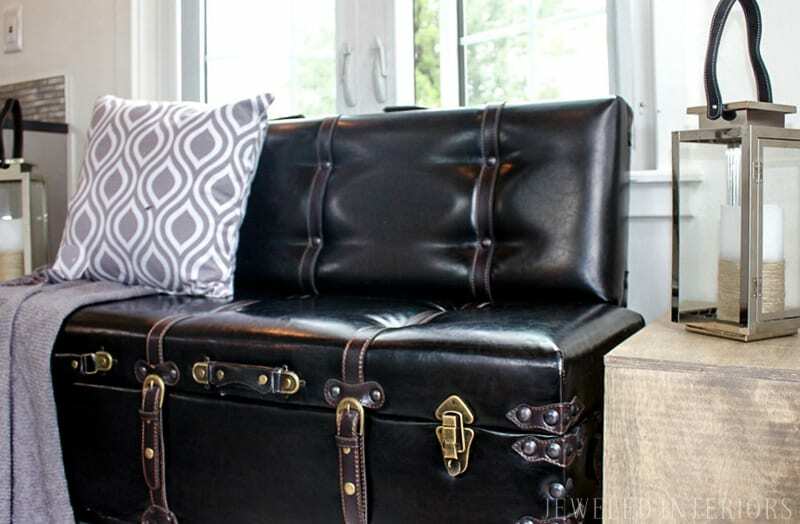 I bought two sturdy end tables that could double as seating in case the buyer wanted this upgrade. These cheeky little stunners were also empty inside and could be used for additional creative storage. 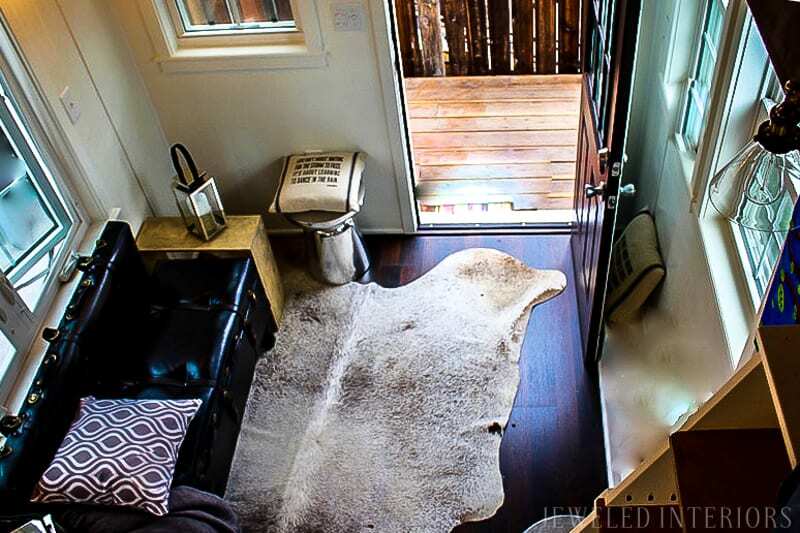 To add warmth and texture, I opted to use a cowhide rug purchased from Tandy Leather (above). 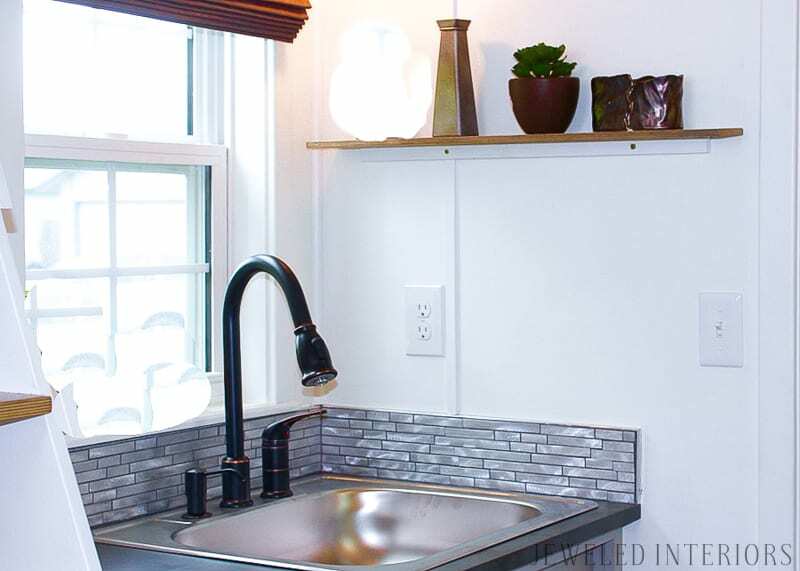 For a lightweight backsplash, aluminum subway tile fit the bill (below). 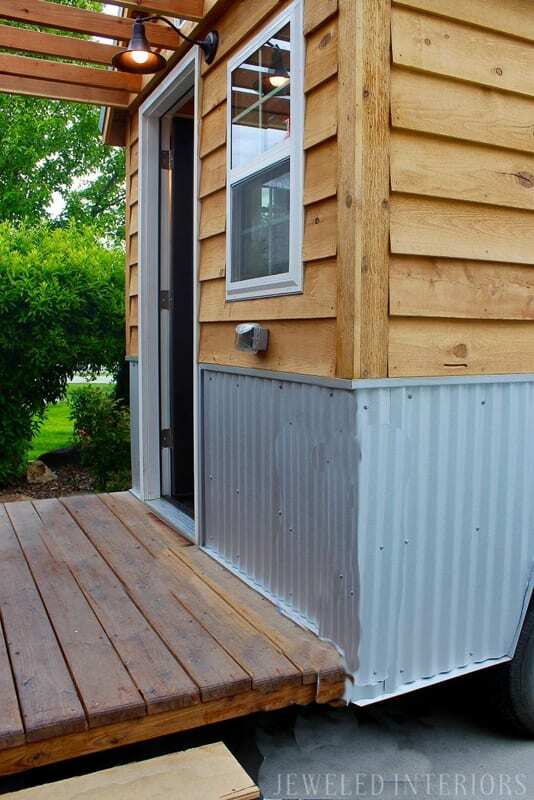 It tied in the aluminum on the exterior with the chic elements of the interior. 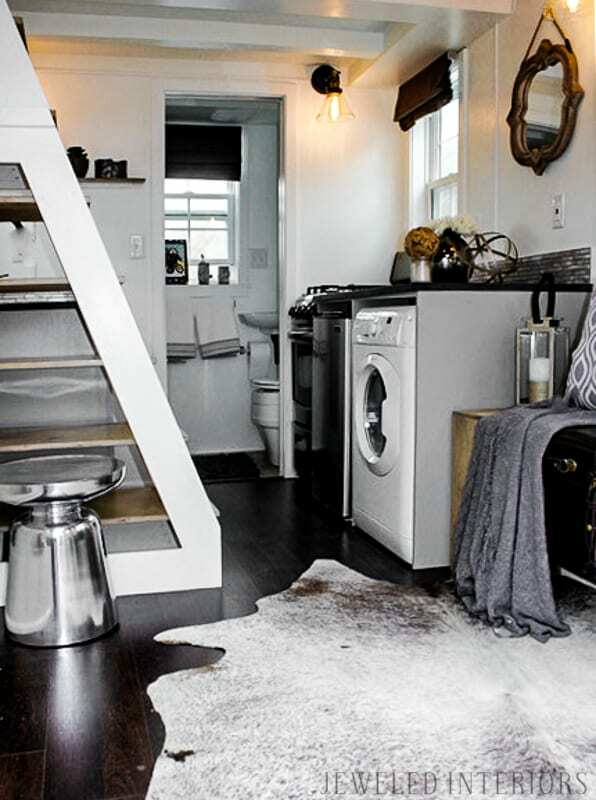 True to tiny home living, the bathroom had to be functional and space saving. A tiny 12 x 7 inch sink was add to the composting toilet. A small mirror was added behind the toilet. 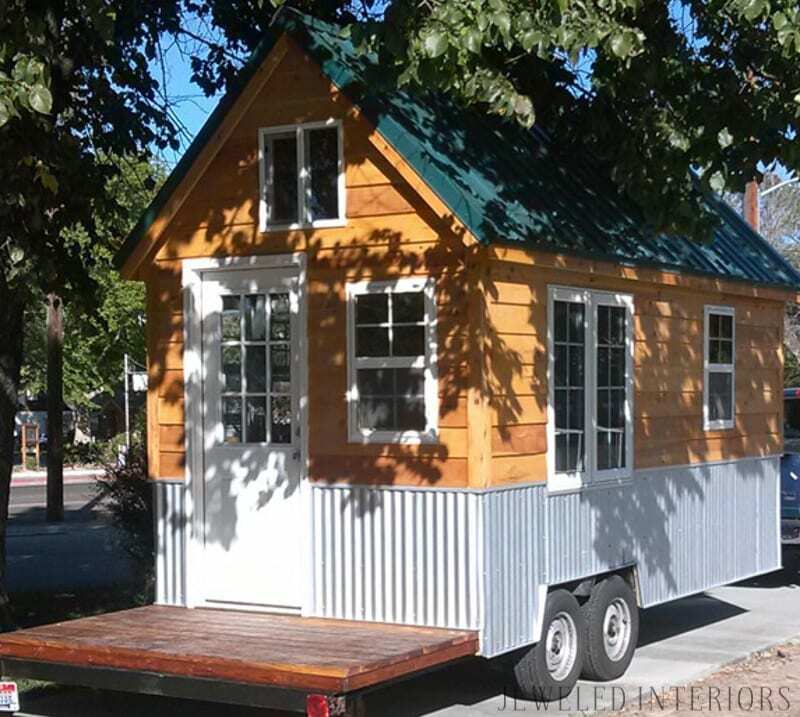 One advantge to designing a tiny house is that it is often easy to find small amounts of supplies at a discount. For example: I drove to a countertop factory that was going out of business. 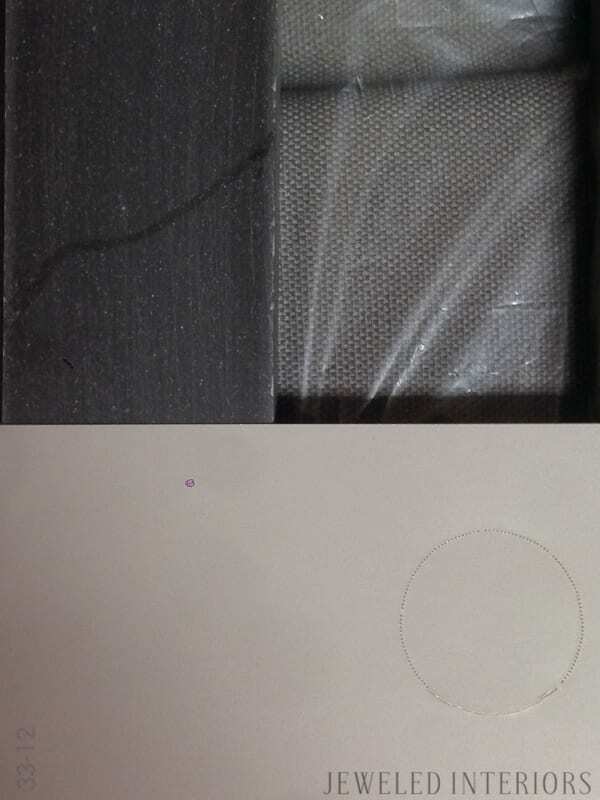 They had an entire area of “seconds” that they were selling for uber cheap. I picked up two that matched and did a happy dance when I saw the price. Mr. Holland polished them up and beautifully installed them. Please feel free to contact me if you would like to be put in touch with Mr. Holland. It was a complete joy to work with him and his students. What a blessing to get to do what I love doing, all for a good cause. I’m happy to report that this beautiful home sold quickly and easily! thanks so much for source info!